Nails 4 Dummies! : Polish Us Pink #2 Ombre Dotticure! Good morning lovelies! We are back for another Breast Cancer Awareness manicure! I finally got to play with my dotting tools and it turned out pretty good if you ask me! After I looked at the photos of this I realized that the colors on the index and middle finger should have been switched so that's what I'll apologize for today because I have no sense of color! Before I show you the mani, I want to say a HUGE thank you to Missy over at Gnarly Gnails for the sweet new blog layout! Not only is she an incredibly talented nail artist and sweet person but she is also a graphic designer! Did you see the little social media icons in the sidebar? They're little polish bottles! She freakin' made those :o ! So go follow her blog if you don't already because she's a bowl of awesome with a double scoop of awesome sauce on top! The base polish is one coat of Julep Olivia. I. Love. Julep. It was beautiful and easy to apply! On the thumb is China Glaze Traffic Jam, index finger is Lancome Rose Boudoir (another amazing formula! ), middle finger is China Glaze 108 Degrees, ring finger is Wet 'n Wild Lavender Pearlescent and pinky is Wet 'n Wild Tickled Pink. I will certainly be breaking out my dotting tools again soon. They were easy to use and I love the polka dots! Thanks Jazz, they were fun and easy to do! Thanks Ellie - I love my new "home"! I just did Breast Cancer awareness nails too! you did such a lovely job! Supporting such a great cause I hope we can find the cure one day! 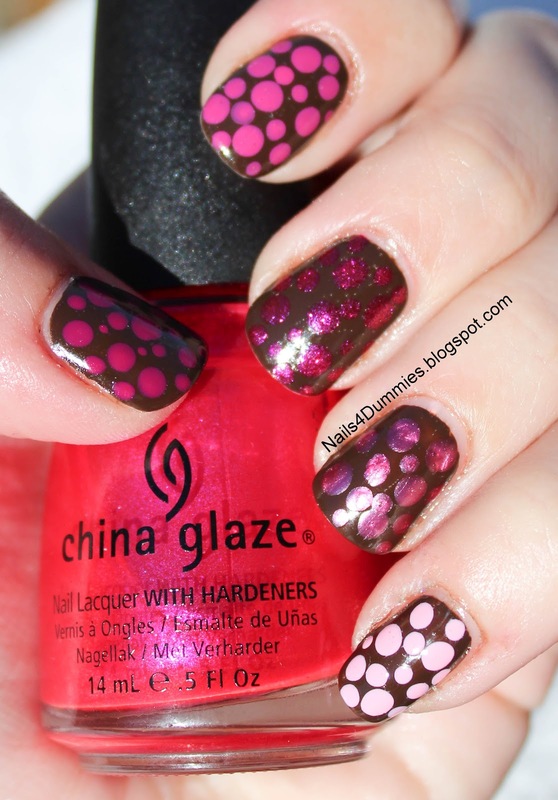 I blog about fashion inspired nail art, I would love if you dropped by to check it out! 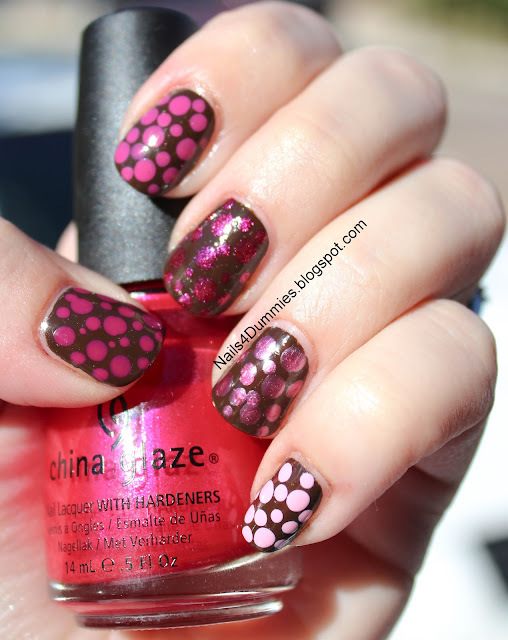 Ombre dotticure--what a great idea! Thanks Karen! Your blog is beautiful as well! Those dots look perfect! My favorite is your pinkie finger. Mine too! I love the pale pink on the chocolate brown and the creme polishes dot the best!